Headfort’s Brian Casey closed with a super 67 to cruise to an impressive, wire-to-wire, five-shot victory at the Alps Tour Q-School in Spain. But the final day was a disaster for former British Amateur champion Alan Dunbar after a disappointing 79 left him four shots outside the mark on three over. “Oh my God, I like so much to be on top!” was the memorable quote attributed to Casey by the Alps Tour website after he finished on 14 under par at La Cala, firing seven birdies on the Asia Course. Brian Casey holes out on the final green. Picture © Tommy O'Driscoll. “It’s my first ever card so I am actually delighted about that,” said Casey, who earned €600 for the win. “I’ve got so much to play next year that’s for sure. It’s giving me a sense of security. I like to be a part of the Alps Tour. A birdie two at the 17th proved crucial for Ward, who closed with a level par 72 to win a full card on the one under par limit. But Dunbar, who started the day four shots inside the top 35 and ties in joint 12th, had a day to forget. Out in two over par, the Rathmore player birdied the par-five 10th but then two sevens in a homeward 41 that also featured two bogeys and just one birdie. The first seven was triple bogey at the 12th but while he was still inside the qualifying places following a birdie at the 13th, he bogeyed the 14th and 15th and then kissed his card goodbye with a double bogey seven at the par-five 16th. France’s Romain Schneider (68) and Spanish amateur Javier Gallegos (69) grabbed the second and third cards respectively as they tied on nine under par. 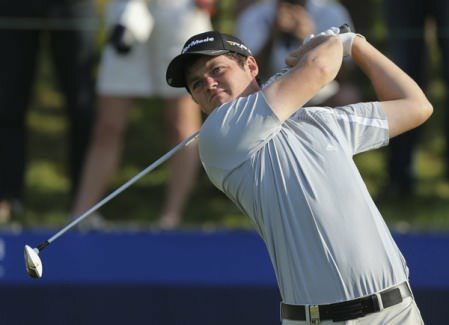 Brendan McCarroll paid tribute to pals Simon Ward and Brian Casey as well as his new life coach John Hession as he claimed his first Alps Tour win of the season in stifling heat in Madrid.